Posts categorized "Faith, Humor & Support"
Lord Peter Mandelson, Britain's business minister, who is second in line to Prime Minister Brown, recently spent 24 hours in St. Mary's, - a British hospital where urologists took care of his benign enlarged prostate. On leaving the hospital, news sources reported he "praised the National Health Service after his 'very successful' operation for an enlarged prostate gland. As he left St Mary's hospital in Paddington, west London, he thanked staff who treated him." Many of us who face prostate cancer, whether ours or that of a spouse or other family member, have to remember that life doesn't stop when illness strikes. If anything sickness can spur further growth, as long as we're willing to rise to new challenges. 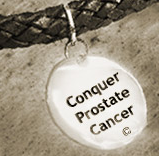 One of the features offered at www.ConquerProstateCancerNow.com are quotable quotes to inspire prostate cancer patients, survivors, wives, other family members and friends. The citations offered to our readers are derived from my book that inspired this blog, as well as many other sources. After all, insights about dealing with life's ups and downs are never the province of one person. "A good urologist should be paying attention not just to the incision or the disease, but to the other health factors as well, such as emotional recovery, sexual recovery and urinary recovery." --Dr. Judd Moul, director of the Center for Prostate Disease Research in Washington, D.C., cited at HealthCentral.com. News anchor Heidi Godman of ABC-TV in Sarasota, Florida, interviews prostate cancer survivor Rabbi Ed Weinsberg, Ed.D., D.D., about doctor patient relationships and questions to ask your doctor. Whenever we're "down" about prostate cancer or a myriad of other concerns like the current economic crisis, it's a good idea to remember the old saying, "I never promised you a rose garden." Rather than falling into the trap of self-pity, this comment reminds us that as far as we know, ever since Adam and Eve, nobody can claim they have lived in paradise! This applies especially to those who have experienced a disease like prostate cancer or its after effects. Author Virginia Satir has paraphrased this thought by pointing out that, "Life is not the way it's supposed to be. It's the way it is. The way you cope with it is what makes the difference." In other words, when illness strikes the only way you can overcome pain and sorrow is to choose to cope rather than choose not to cope. In making that fundamental choice you won't regain paradise, but neither will you feel your life is hell. For the most part life can be lived somewhere between those two extremes. The decision is yours to take in the fragrance of the rose even when you touch its thorns. As some of our readers may know, long before I had prostate cancer I spent most of my 30 years as a congregational rabbi on Boston's North Shore until I retired in 2006. During that time I made sure not only to serve my own "flock", but to be an active community leader, involving myself in Jewish and general concerns. This included serving as chairman of an annual clergy AIDS walk and engaging in other interfaith endeavors. Sometimes I get notes like the following letter, which remind us that we need to do what we can to contribute toward ongoing prostate cancer research. In this case, another prostate cancer blogger and friend, Darren Ritch, has conquered prostate cancer to the point where he has now entered his first triathlon to raise funds for the Prostate Cancer Foundation. I gave him a modest sum to help him reach his initial goal of $500. Please consider filling in the form listed beneath his personal letter below. Give from your pocket and your heart, so others can conquer prostate cancer too!